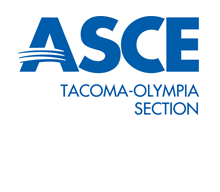 The Tacoma-Olympia section provides support to members in the South Puget Sound region all the way to west to the coast and south to the border with Oregon. Our Section is part of Region 8, which covers most of the western half of the United States. Our mission is to deliver value to our members by helping them succeed and enhancing their careers through education and networking opportunities. We do this from the ground up (no pun intended) and place special importance on those factors which unite all civil engineers in every technical branch of the profession. Use the links at the top of the page to navigate about our site. If you're new, consider coming out to one of our meetings. You can RSVP directly through our Events page. Feel free to contact us if you have any questions. We're happy to help! Check out some of our past events, and Like our Facebook Page! To become a sponsor, please contact our Treasurer.